You (and your sleep!) can rest assured that our White Lotus Home sheets, which are made only from 100% cotton, are handmade in the USA in New Jersey. The sheets are crafted from long staple 100% cotton yarn woven in a double pick, 4/1 pattern to create a silky, smooth, and breathable sateen finish. 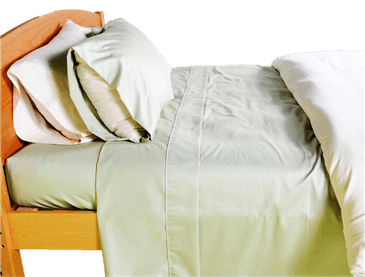 They not only make a great addition to your natural bedding, but also offer a great alternative to conventional sheets, which oftentimes are blended with synthetic fibers, processed with harsh chemicals, or treated with fire retardants. You have plenty to worry about, but, with our 100% cotton sheets, you can sleep soundly and dream away! The thread count on these sheets is 220. Do your raw fibers have an odor? What is the earthy scent in my mattress and pillows? All White Lotus Home products, from our pillows to our mattresses, are crafted from raw, untreated fibers. Many customers notice the raw cotton in particular, whose sweet smell can smell a bit like cooked rice. Depending on the style of your mattress, you may be picking up on the mild scent of our natural latex or virgin wool as well. Because our fibers are is minimally processed, they maintain their original odor --- some may notice it, others may not. If left out in the open, the smell should dissipate within a week or two, depending on your sensitivity. Our handcrafted mattresses and toppers are made with minimally processed fibers and unbleached cotton, while our pillows contain only your selected fill and an exterior case of Organic Cotton Sateen. As many of our customers experience chemical sensitivities, no added chemicals, dyes, or fragrances are added at any point in our production to either the interior fill or exterior case. We take our customer's medical needs very seriously and would never purposefully add undisclosed ingredients to our products. What is the difference between Green Cotton & Organic Cotton? Organic Cotton is exactly as it sounds --- 100% USDA-Certified Organic Cotton. The entire lifecycle of the cotton plant can be certified, from soil to seed to the final harvesting. Green Cotton is conventionally grown, so it may or may not have been treated with pesticides in its lifecycle. After harvesting, however, our Green Cotton is not sprayed with any further dyes or chemicals. The end result is purely unbleached, untreated, raw cotton.